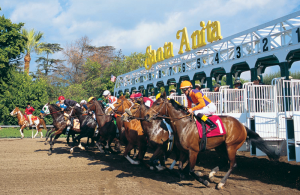 POST TIME: 12:30 PM – Arrive Anytime! Park Entrance Fee, Parking, Program Book, Gourmet buffet lunch, Handicapping booklet, Handicapping Expert for the group, Named Race for CAAU/CMCF with representative group picture in Winner’s Circle, entry into Raffle, convenient betting windows and machines, great view of the races, all with good company, and all for a good cause! Registration for this event is no longer being accepted. Thank you for your interest.